Hi! 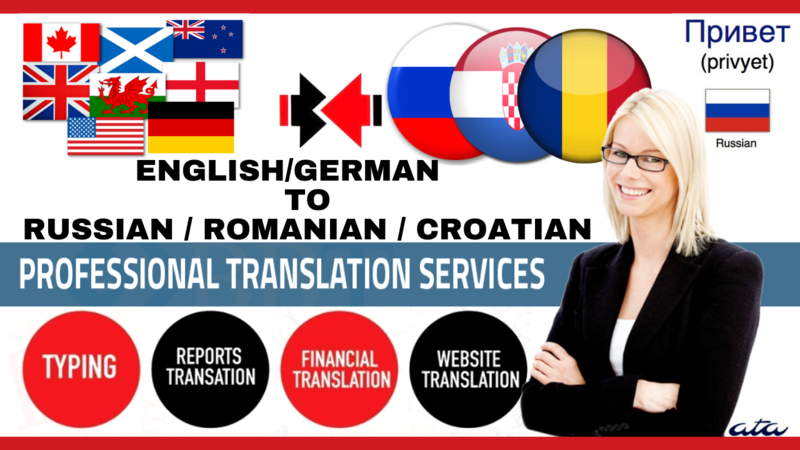 Welcome to Global Translation Agency: Are you looking for flawless, accurate, professional and manual translations, by a native Russian/Romanian/Croatian speaker? If so, you’ve landed on the right hourlie! We offer fast, affordable and excellent English to Russian, Romanian, Croatian and Russian, Romanian, Croatian to English, Russian/Romanian/Croatian to Spanish, French, Italian, Polish, Dutch, German and Portuguese translations services. The translation that you will receive from us will be done manually, we guarantee there will be no google translate, programs, unauthorized persons or machine translation. All my translations include proofreading, formatting, editing and language style. We translate not only the words but also the natural meaning to preserve the originality of your text. Our previous translation projects included translations of Articles, Press Releases, Websites, Blog Posts, Newsletters, Web Shops, Business Plans, Technical Manuals, medical, legal, financial, Standard Letter Templates, Compliance Letters, Contracts, Terms & Conditions, Product Descriptions, Career Documents any texts relating to Customer Service or Hotel & Tourism and much more. If you have any questions, please don't hesitate to get in touch. If you need more words than, please see our extras or message us. Please don’t waste any more time! send us a message and submit the documents in one of the following ways: word format, pdf, website link, excel sheet only. Any other format will not be processed.